An excellent development opportunity, offering a spacious garage and shower room on the ground floor, as well as an equally large studio space on the first floor. Stories Road is ideally situated close to East Dulwich which offers a range of shops, restaurants and amenities, as well as East Dulwich Rail station and a number of bus routes. A lovely family-friendly café just off Bellenden Road that serves tasty homemade food. 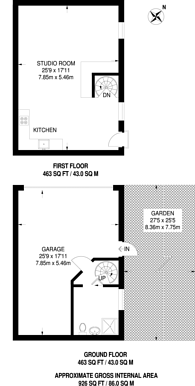 926 (86 Sq M) approx.